The Honda Freed (Japanese: ホンダ・フリード, Honda furīdo) is a mini multi-purpose vehicle (MPV) produced by the Japanese automaker Honda since 2008. The vehicle is a replacement for the Honda Mobilio. The Freed is based on the Jazz/Fit platform. Three different versions of the Freed are available: a seven-seat version which features captain’s seats in the second row; an eight-seat version; and a five-seat version. Honda also stated that a wheelchair-accessible model is offered in addition to versions with a side lift-up seat and passenger lift-up seat. In September 2009, it was announced that a hybrid version would be available by 2011. The Freed is equipped with a 1.5 L engine with 118 horsepower, which is the same engine that is used in the Jazz/City, but the engine used has more torque. For example, the Freed's engine has 118 horsepower and 148 Nm of torque, while the Jazz/City has 120 horsepower with 145 Nm of torque. On 21 March 2009, the first generation Freed was launched in Indonesia, the second country where the Freed was released after Japan. It is assembled at Honda's Karawang Plant and exported to other South East Asian markets. The Freed's ground clearance is 20 mm higher. For the Indonesian version the Honda Freed use the 7-seater layout and a 5-speed automatic gearbox instead the CVT transmission in the Japanese Domestic Market version. The Freed for the Indonesian market consists of 3 trim levels, the A, S and E. It was facelifted on 8 May 2012 and received the last update in September 2014. The E trim comes with anti pinch function on both sliding doors, retractable door mirror with turning lamps, and double din audio monitor with iPod/iPhone compatible. The first generation Honda Freed was available in Japan in 2 forms; the petrol powered in G or G Aero grade and hybrid variant. The hybrid variant uses i-VTEC together with Honda's IMA hybrid car technology. A facelifted Freed was launched in the Japanese market on 28 October 2011, securing sales of over 20,000 units in its first two weeks on sale, of which 63% were of the hybrid model. In 2010, Honda released the 'soul twinbrother' of Freed called Freed Spike for Japanese markets only. Honda said that this car is a "compact multi-wagon" for the people with "active lifestyle." This car features a whole different grille, headlamps, and front fascia; a covered third side window, partially covered taillights, and new alloy wheels. Inside, apart from the familiarly similar dashboard to Freed, it has a dual height floor in the cargo area and some additional storage areas on the side panels. The Freed Spike was replaced by the second generation Freed+ on 16 September 2016. On 22 April 2010, the Freed was launched in Malaysia. It was only available in one trim level (Grade E). Honda Malaysia targeted to sell 1,200 units a year. In July 2012, Honda Malaysia added a cheaper version of the Honda Freed called the Grade S. It was priced RM99,800 on-the-road with insurance. Features lost from the Grade E model were powered sliding rear doors with remote operation, automatic air-conditioning, indicators for the side mirrors or intermittent wipers, tail spoiler and the Alpine DVD player. In January 2013, Honda Malaysia launched the facelifted model to Malaysia. Like before, it was available in two trim levels (Grade E and Grade S). The Grade E model gained some extra features which included leather seats, and fold-down armrests for both front seats are now available across the board (previously only the driver and two mid-row chairs had armrests). The lower spec RM99,800 Grade S is available in Brilliant White Pearl, Polished Metal Metallic and Crystal Black Pearl. The RM113,500 Grade E can only be had in Brilliant White Pearl. On 23 January 2011, the Freed was officially launched in Hong Kong. Unlike other non-Japanese market models, all Freeds sold in Hong Kong are manufactured in Japan and seats 6 passengers. In Singapore, the Freed is available from the authorised distributor and also through parallel import distributors. The second generation Honda Freed was revealed in June 2016 and launched in Japan on 16 September 2016. In August 2016, the advertising campaign of the second generation Freed in Japan uses Pharrell Williams' "Happy" from the animated film Despicable Me 2. The new Freed is conceived based on the "Dynamism and Functionality" theme, does not differ much in looks from its curvier predecessor. Apart from the updated grille and lights, the new Freed retains the rear sliding doors with some minor improvements. It is also offered in 5-seater option as the Freed+, which replaced the Freed Spike in the previous generation. In December 2017, the Honda Freed Modulo X was launched in Japan. It featured a full body kit, front and rear bumpers, side skirts, and a tailgate spoiler. ^ Tan, Danny (22 April 2010). "Honda Freed "premium compact MPV" – RM112,980". paultan.org. Retrieved 24 October 2018. ^ Lim, Anthony (5 July 2012). "Honda Freed – new Grade S variant debuts, RM100k". paultan.org. Retrieved 24 October 2018. ^ a b Tan, Danny (31 January 2013). 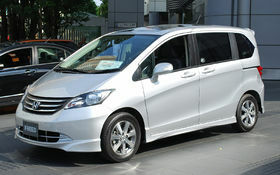 "Honda Freed MPV facelifted – RM99,800 to RM113,500". paultan.org. Retrieved 24 October 2018. ^ "And then, they were Freed!". Retrieved 2009-09-20. ^ "Honda Freed Review in Singapore". Retrieved 2009-12-15. ^ "Honda Freed specs". Goo-net Exchange. ^ "Honda Freed Modulo X officially launched in Japan". Paul Tan's Automotive News. 2017-12-15. Retrieved 2017-12-15. Wikimedia Commons has media related to Honda Freed. This page was last edited on 24 January 2019, at 16:34 (UTC).